If you have limited network coverage, you know that offline mobility for Maximo matters. Your network goes down and you lose work, can’t access documents or work orders, and data is not transmitted back to Maximo. Limited network coverage can be caused by many reasons -- rural areas, underground, or security. That’s why your Maximo mobility solution must support offline – whatever the cause – be it limited network coverage or Maximo downtime. Let’s see why this is so important by reviewing a typical work management scenario. Work Orders originate in Maximo as either preventative or corrective maintenance work. They are then scheduled and assigned to a technician or crew. 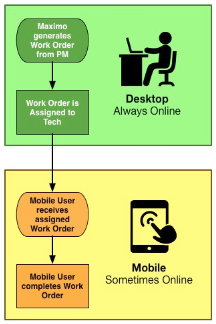 The assigned work orders will be pushed to the user’s device where the user will complete the work. The work may include recording results of an inspection, changing fluids on a schedule or completing a repair. While completing the work, the technician may have to lookup additional information associated with the Work Order such as diagrams, location and asset details to assist in completing the work. When the work is completed the technician can decide to attach results, such as from an inspection or annotated photos. If any additional work is found, the technician can create a follow up work order. When your users can access Maximo when and where they do the work, it helps them spend more time completing work and less time in the office. But what happens when they go offline? Without an offline mobility solution, they need to print the work order details, diagrams, inspection sheets complete on site. At the end of the day, they need to update Maximo, upload photos and re-enter the inspection results, scan and attach any documentation to the Work Order. Offline is one of the most important pillars of successful mobility. Successful mobility empowers users to be more successful and spend more time doing their jobs and less time in the office. So What Makes a Mobile Application Successful? Successful mobility is mobility that is adopted and embraced by the users and just works. Successful mobility ensures users are more productive and spend more time completing their job and less time worrying about online/offline and synchronization. The most important factor is when the mobile solution provides a seamless, integrated experience for the end user. If the offline experience is limited or differs from the online experience the users will become frustrated and fail to adopt the solution. The users should be able to create data, utilize lookups, utilize workflow and validate forms while offline. Another important feature when deploying mobility is the seamless transition from online to offline. When the user moves from an online connected state to an offline state the transition should be seamlessly detected by the application with no user interaction. If the user needs to manually synchronize or turn on offline mode the users experience will be degraded and adoption will suffer. It is important for any offline ready mobile-based solution to provide fast, near real-time, automatic no-intervention synchronization. When data changes in Maximo it should be synchronized to the device immediately within seconds to prevent data conflicts and ensure users are always working with current data. When users move from an online to an offline state the transition should be seamless without any manual synchronization or user intervention. Users should be able to focus on their jobs and not worry about whether the device is up to date or needs to be synchronized. Users who are working in an offline environment need to be able to view data as well as modify and update it such as updating a Work Order status. Transactions should be automatically synchronized whenever the device is online. Transactions can create errors if the Maximo business logic raises an error. An example would be if the user were offline for an extended period of time and modifying a Work Order. Another user decided to cancel the same Work Order. When the user synchronizes the device the Maximo will reject any changes to the cancelled work order. Transaction errors should be seldom encountered but should be handled gracefully. If a transaction fails it should be marked so, provide the user will details and allow the user to remove, retry or modify the data. Failed transactions should never prevent the user from creating additional records. Reliable transaction management is one of the most important components of offline mobility. From the time the transaction is created until it ends up in Maximo it needs to be easily traceable. Introducing a Middleware component can increase the complexity of tracing a missing transaction. The moment a user transaction gets lost and cannot be traced the users will lose confidence and the users will fail to adopt the solution. Do you agree? Is your mobile platform for your Maximo elegantly addressing your offline needs? Learn more about Interloc's Mobile Solutions for IBM Maximo.